This series of four workbooks has been specially designed to provide secondary students with a sound understanding of English vocabulary and ample practice in its use. Workbooks 1 and 2 focus on the use of such common words as good, fair, fine and nice which either are rather vague in meaning or tend to be overused. Each book contains 25 units, plus 8 review exercises. 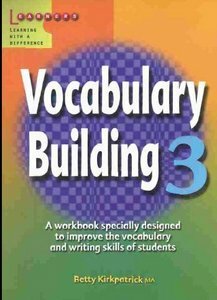 Vocabulary Building 1 specially designed to improve the vocabulary and writing skills of students.